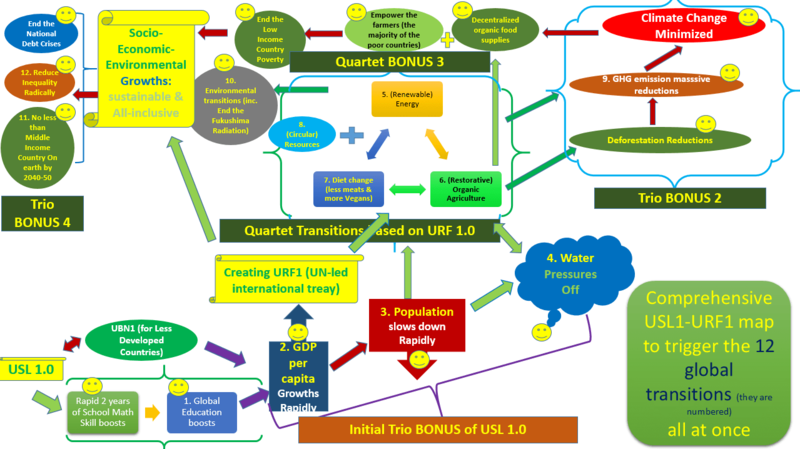 VESUSAGT (Very Efficient Simplified Unified, Sustainable All-inclusive Growth Theories) is the theoretical frameworks behind the USL1-induced global transitions. Most of the typical economic theories don´t cross to the public policy tables much partially due to their unnecessary complexities or at least on the surface. So I have tried to unify the entirety of the major socio-economic theories in an overarching and yet very simple manner. I succeeded mostly last fall and winter but I had to revise to make these very accessible and digestible to most of the policy-makers and shakers immediately. VESUSAGT-based top 12 global transitions, to be triggered by USL1 (to boost the global school math average by 2-5 years, which is roughly advancing about 1 standard deviation compatible to the PISA math scores, in just 2-5 years) coupled with the URF1 (Usl Redistribution Funds 1.0) that we are trying to create with the UN-led binding international treaty hopefully in the General Assembly of 2015 and if that is impossible, then at least to make the UN recognize its potential for the POST-2015 and other top UN projects so that this can be materialized by 2016. We will push 12 major and massive global transitions simultaneously at an unprecedented pace and scale. Time spans for the USL1 impacts to be very tangible: we are trying to complete the global USL1 reforms between 2016-2020 so that most countries on earth can complete the first stage transitions and their effects will become almost immediately visible for the least developed countries starting 2020 on and visible for the developed countries (OECDs) by around 2022-2026. The basic magnitudes of estimations may not change too much although with error bars of 10-30% easily. But this will not matter much. If a country becomes hyper richer with the surplus 6x or 8x or 10x on top of the expected 2-3x richer (which means 12x-30x) is far better than 2-3x anyway. The core ideas behind USL1-VESUSAGT-URF1-12 global transitions are that this massive human capital using the whacky USL1 will boost the math education globally with the extremely rapid reforms in just 2-5 years, which normally may take about 50-80 years in average according to the past history. As the economic gains are so huge that to take a UN treaty and to create URF1 (Usl Redistribution Funds) for making the rich 40-50 countries use the service to provide the 1% of their annual GDPs to commit to the developments of the poorest about 50 countries, and only to the poorest half of these poorest countries not their upper echelons first. Something that has been never done before! Why we recommend the 1% of the annual GDPs and what this means? Roughly put with a bit of risk of over-generalization, we can estimate as follows. 1) 1% of GDP of the average Americans or from the OECD countries are equivalent to (using the economic classifications of the World Bank here). 50-100% of GDP to the poorer half of the average Sub-Saharan African or other least developed countries’ people incomes. Between January and April 2015, there have been more extensive developments and USL1 is trying to trigger the 12 key massive global trasitions between 2020 (the year we try to complete the first USL 1.0 global math-induced reforms in 2020) and 2040. Most people may think that each of these are mostly unrelated, but they are all intimately inter-connected and cannot be separated from one another. These are the mere blueprints and we expect to adjust accordingly as we try to finalize the preliminary VESUSAGT series sometime in May 2015. Math & Science Education transition: (boosting the nationwide school math skill levels by 2-5 years, which will be equivalent to about 1 standard deviation boost in PISA math scores, with the reform time of only 2-5 years): the world average takes about 50-80 years to advance 2-5 years (or 1 standard deviation) of school math in general. For example, in the USA or Europe, the western countries advanced their national average math by only about 1-1.3 years (or 0.5-0.65 Standard Deviations or even less) over the past half a century or so to give you the glimpse of how hard it is. Even the fastest math skill growing nations on earth – even if they are lucky and consistently progressing throughout – will take minimum 20-25 years to advance the national average school math skills by 1 standard deviation, and probably much longer than this usually except only one region in the world for several decades, notably from the Eastern Asian countries. So this is the part 1 action plan of the USL1 (to boost the 1 standard deviation of national school math or 2-5 years of level differences) and will start with USL 0.5 (to boost the first 0.5 standard deviation or 1-2.5 years first) with the USL1-embracing member nations. The transitions may take between 2016 and 2020. The science parts will emerge once the first series of the math education transitions are successful. The first of these 3 transtions (#1-#3 transition will be directly induced by the USL1 alone without URF1 (although further augmented after URF1 obviously). The rest will follow once the URF1 (the UN-led USL1-initiated international treaty) is formed. Education transition: the completely free and much more efficient, national level education up to high school in all of the less developed countries. This will take place after the initial about 5-10 years of the successful USL1 implementations of the member nations. Economy transition: boosting 2-5 years (or 1 standard deviation) of national average school math is roughly equivalent to boost the SURPLUS Real GDP per capita by 2% over the next 60-80 years (which is roughly like doubling the GDP growth rates of most countries, meaning the GDP doubling time will roughly be halved.) according to the Hanushek-Woessmann theories. Another version is that GDP per capita in PPPs will be about SURPLUS 8x more than without USL1 over the next half a century. My current estimations show that USL1-embracing countries may have typically 4-6 times larger GDP per capita in PPPs in just 20-40 years, especially for the less developed countries. Population transition: according to most of the major population growth projections in the world, the world population will be roughly between 9-11 billions around 2050. About 90% of the growths for the next 35 years will take place in the less developed countries, especially from the Sub-Saharan Africa. USL1 can trigger the new growth limits by 40-70%, which will have the profound the implications on the population-induced pressures on foods, water, resources, energy, GHG, and various instabilities around the globe. Keeping the population to 8-8.5 Billion instead of 9-11 Billion by 2050 is what USL1 will be able to contribute. Agriculture transition (To move away from the currently popular and yet environmentally devastating industrial agricultures to the quasi-100% organic agricultures particularly utilizing the permacultures and the restorative organic agricultures), which can reduce the water use and GHG emissions by 1/3 and much more). Meat diet transitions: to reduce the current levels to half or even ¼ of the current level by 2050 (and I have various specific detailed plans) as meat consumptions are heavily responsible for the water shortages, Methane emissions, and the food shortages, etc. Resource transition: to the complete recycling to 99% (Circular Economy): this will lessen the pressures on the resource, water, energy, material, and environment significantly. Climate change mitigation transition: this will arise as just a bonus. Poverty elimination transition (not just the UN´s End the Extreme Poverty with those who earn less than $500 per year, but I mean end those who earn less than $4,000-6,000 from the entire world in just 20-30 years, not next century). This goes far beyond UN operations for the POST-2015 by about 3x-4x by 2030, but to 10x by 2040. Equality transition (starting with the fair income distributions. Yes I have already alternative to replace the Gini coefficient which most economists use.) I am suspending to release this for now because the corporate hyper powers in the governments may not like my ideas. So I need to release after my ideas start building momentum.